"As we age, our skin changes, thanks to hormones and the natural process called 'life.' Because waxing gently removes dead skin cells, the process doesn't just get rid of unwanted hair on aging skin, it helps exfoliate the surface, lending it the glow of youth while improving the texture." "If you're using any anti-aging products or have recently gotten a facial, you've got to loop in your waxing professional. Same goes if you're on medication. These can all affect your skin's sensitivity and some can actually thin the top layer of the skin. Your pro will tell you how to proceed." "Waxing actually does make your hair grow in thinner, unlike shaving, because it depletes the resources of the hair follicles without destroying them. It treats skin gently and maintains your original pigment, too." Sigh. There she is again, with her jeggings and belly top, like she hasn't had two kids. Wait, maybe she didn't. Quickly, you scan your memory: Did she adopt? No. She even asked you for advice on what to use for stretch marks. Maybe she had a tummy tuck, you hope, because that would explain her taut stomach - and give your surgery-free belly a pass. You ponder the possibility as the gentle jealousy bubbles around your muffin top. Or, maybe it's just the actual muffin you ate earlier. Either way, it doesn't feel good. Here's what does: Breaking away from the never-ending cycle of comparison and, instead, using what we perceive as the success of others to motivate ourselves to accomplish our own goals. Lately, the body shapes we covet have one common element: Lagree Fitness. Meghan Markle, of "being a princess" international fame, swears by it - but so too do everyday women and men who crave a sane pathway to body bliss. 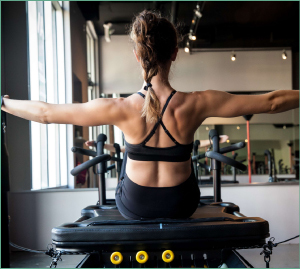 Lagree Fitness was developed to lengthen, tone muscle and torch body fat - and when performed on the M3 Megaformer, results are quickly obvious. The movements are slow and controlled; the intention is to trigger the slow-twitch muscle fibers. These fibers are your endurance muscles - your longer, thinner, fat-burning friends who don't often get spoiled with such attention. While on the Megaformer, you'll move seamlessly from one exercise to the next, keeping your heart rate up while you learn the form. It doesn't take long for you to feel like a pro, building lean muscle while whittling that waist - and developing strength inside and out. Who knows? Maybe after a few sessions, your hyper-healthy neighbor will swing by again for advice, this time - about your boppin' booty.